We hope you will learn more about us and join us for our monthly programs. Founded in 1995, the Larchmont-Mamaroneck Local Summit is a volunteer community organization that works to facilitate dialogue and collaboration among government, schools, non-profits, businesses and citizens in order to promote positive change for our tri-municipal community. It does this through its monthly public meetings where issues of local concern are addressed. It also encourages individuals and groups to work on solutions to these issues. "The State of Our Public Schools"
TAKE THE LMCTV SURVEY NOW! ZERO WASTE: As a follow up from our January 15 program on Zero Waste, click here for a tip sheet on what you can do to move closer to Zero Waste. 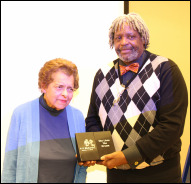 ​Congratulations to Local Summit Board member Kay Francis Richards for being honored by the Larchmont-Mamaroneck Committee for Human Rights at the Martin Luther King, Jr. Commemoration event held on January 9, 2016. She and Clifford Wolf were honored for their outstanding volunteer work exemplifying the Dream. Missed a recent program? Our "In the News" page has links to press coverage of recent programs. Click here to read about them or watch recordings at LMC-TV Online.